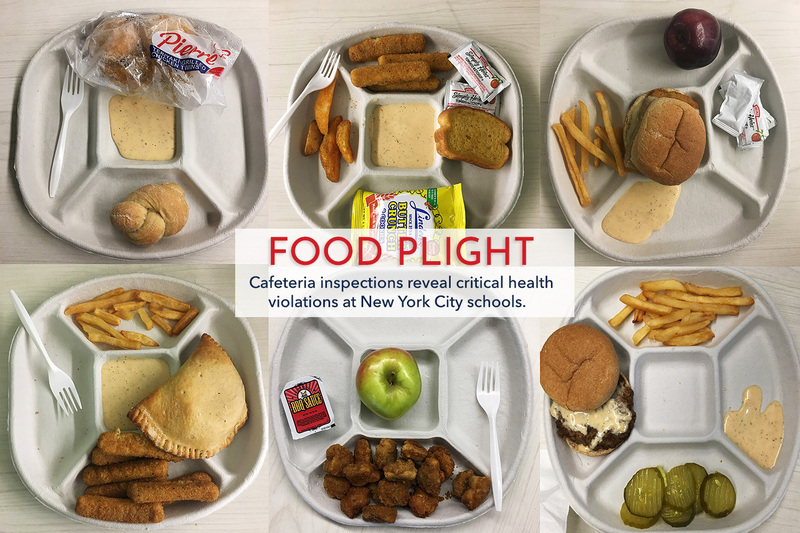 FOOD PLIGHT | Cafeteria Inspections Reveal Critical Health Violations at New York City Schools. 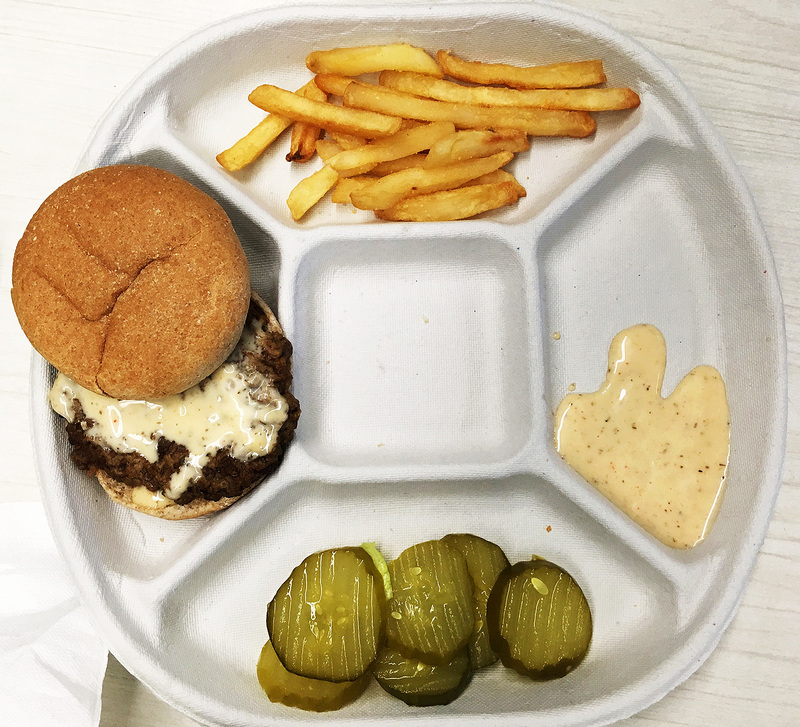 At Public School 398 in East Flatbush, Brooklyn, elementary school students were offered a lunch of beef patties, zucchini and pears on March 20. A city health inspector discovered some unappetizing conditions in the cafeteria and kitchen that day: live roaches and close to 600 fresh mice droppings – all conditions primed to cause illness. At Middle School 137 in Ozone Park, Queens, where the kitchen prepares more than 700 meals for five area schools, an inspector found about 1,500 flies on July 12. The Health Department gave the school two days to clean up and put all food in rat-proof containers. While there was some improvement when an inspector returned July 17, flies still loomed and the kitchen remained dirty. The school got another two days to fix the violations. Only on the third try were the problems rectified. At P.S. 132 in Williamsburg, Brooklyn, a school nurse reported in September that five second-graders were sickened after eating a cafeteria lunch of peanut butter-and-jelly sandwiches, cheese sandwiches and milk. School officials said there was no evidence the illnesses were caused by school food and called the nurse “overzealous.” But a health inspector who responded several days later found dirty equipment and poor protection for how food was laid out – potential breeding grounds for foodborne illnesses. 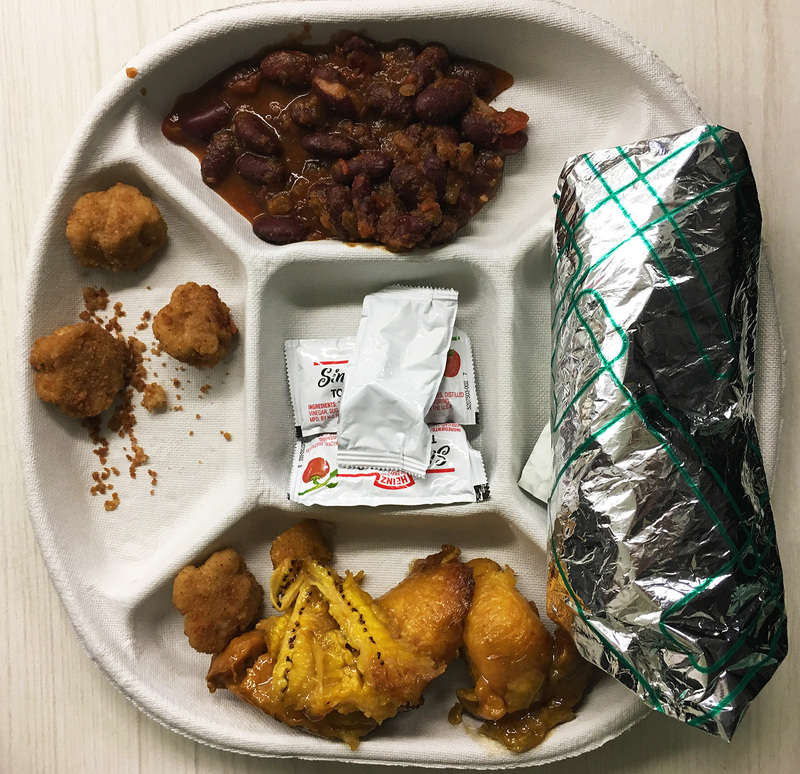 Nearly 700 school cafeterias – about half of the approximately 1,400 inspected by health officials in 2017 – received at least one critical violation, which indicates the kinds of problems that could lead to foodborne illnesses. City health inspectors discovered an average of two violations per school cafeteria visit. While some schools had no violations, as Health Department officials pointed out, other racked up more, driving up the average. One of every five of the citations is a critical violation – something that could lead to foodborne illnesses. More than half of the 1,150 critical violations reported in 2017 show evidence of mice, rats, roaches and other insects in food preparation and consumption areas, along with flies. The four dozen schools with the worst inspections records in 2017 largely serve some of the city’s poorest students. The students who go to these schools tend to be disproportionately minority group members, city records show. The statement noted that in 2016, 97 percent of schools passed inspection and “any violations were immediately addressed.” Yet under the point system used by Health Department inspectors, schools could still pass after being given multiple violations. A Department of Education spokeswoman pointed to the Health Department statement and noted that inspection records are now online. Still, those records are not as extensive as the ones obtained by the NYCity News Service. More than two dozen students interviewed at some of the schools hit with the most violations in 2017 said they avoided eating in cafeterias because of bad quality food or cleanliness concerns. 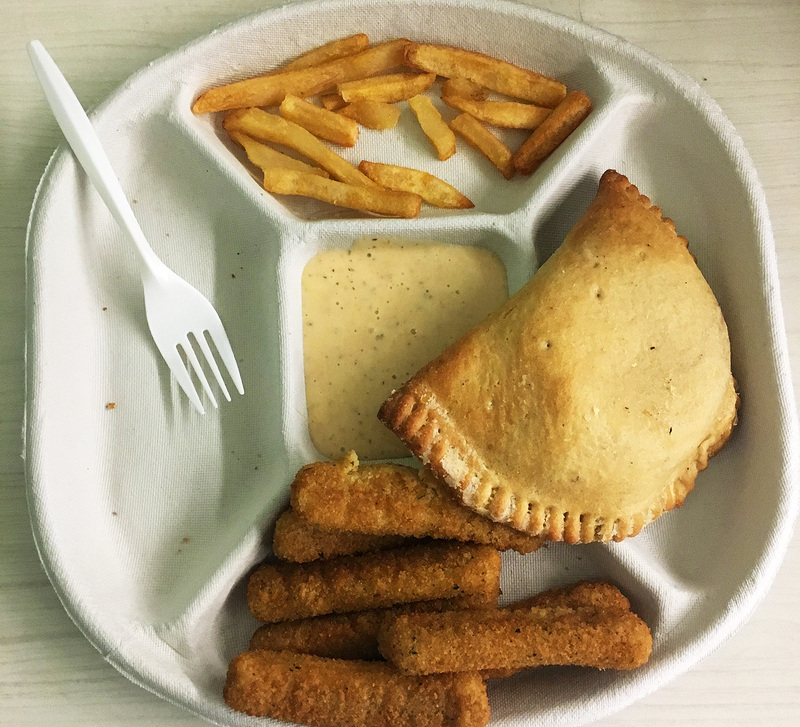 Angel Rosario, 17, recalled becoming queasy after eating mozzarella sticks from the school cafeteria in the Urban Assembly Bronx Academy of Letters in Mott Haven. He said his family took him to a doctor, who diagnosed food poisoning. Rosario said he did not report his illness to the school – he didn’t think his experience was unusual. Now he rarely eats in the cafeteria. 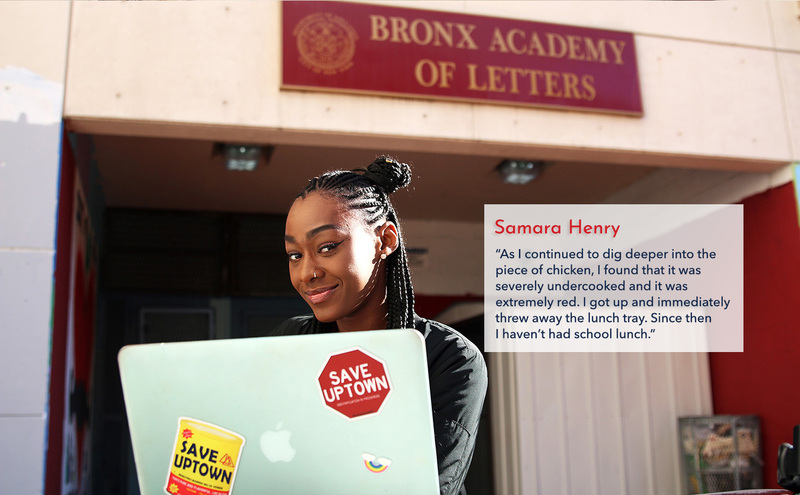 Samara Henry, a senior at the same school, said she stopped eating at the cafeteria after encountering what she believed to be undercooked chicken about two years ago. In its most recent inspection, conducted July 10, the Health Department found five critical violations at the school cafeteria – including evidence of mice, flying insects and workers wearing dirty clothes. Shaun D. Francois, President of Local 372, the union representing school food workers, cited a dire need for more staffers at aging school cafeterias. “We’re already overburdened. We don’t have enough manpower,” said Francois, who worked four years as a school food handler and until 2014 as a school food distributor at the main Long Island City warehouse. Francois said kitchens were already understaffed before the city introduced its free lunch program for all students at the start of the 2017 school year. He met with School Food to state the union’s need for at least 300 workers based on the ratio of how many students need to be served. He said he worked with school officials to plan two hiring sessions with 2,000 prospective employees in the fall. But Francois said the positions have not all been filled, leaving staff stretched thin. 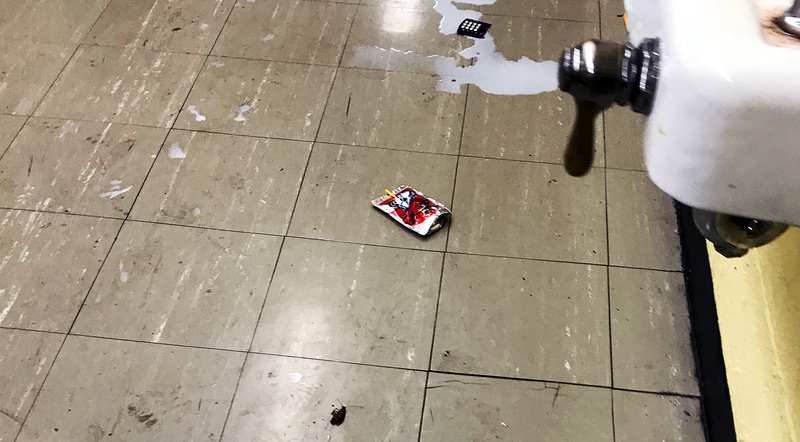 A dead roach, next to a water fountain at the Urban Assembly Bronx Academy of Letters on November 21, 2017. School cafeteria inspections are similar to the ones for restaurants, except there are no letter grades. No placards are posted by school cafeterias with an A, B, C or “Grade Pending.” Instead, a numeric scale tracks the count and severity of violations. The higher the number, the worse the conditions. Inspectors are supposed to visit without warning and examine the kitchen. They look for evidence of rodents and insects. 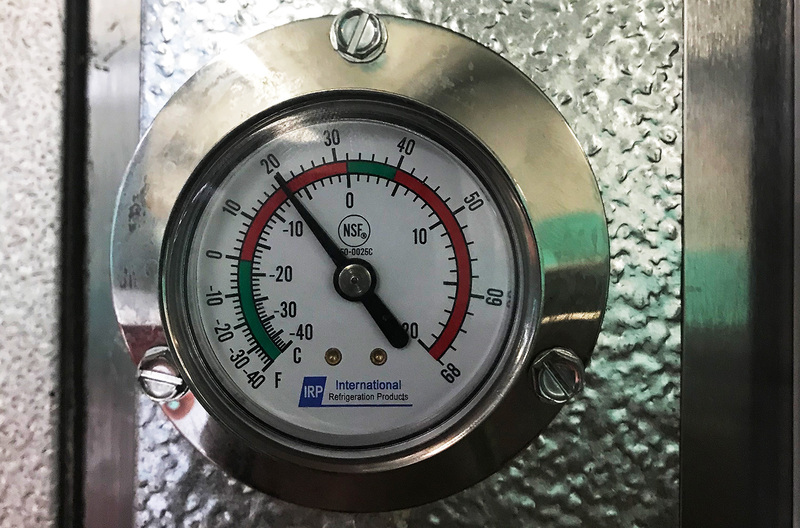 They check whether equipment can keep hot food hot enough, and cold food cool enough – the right temperatures are crucial to avoid the spread of bacteria. They ask workers questions and review food handling. If the results prove unsatisfactory, health inspectors may schedule a mandatory re-examination a few days later. More than a dozen city schools – including MS 137 in Ozone Park, where an inspector found 1,500 flies in July – faced that situation in 2017. Federal law requires local health inspectors across the country to inspect school cafeterias twice every school year. 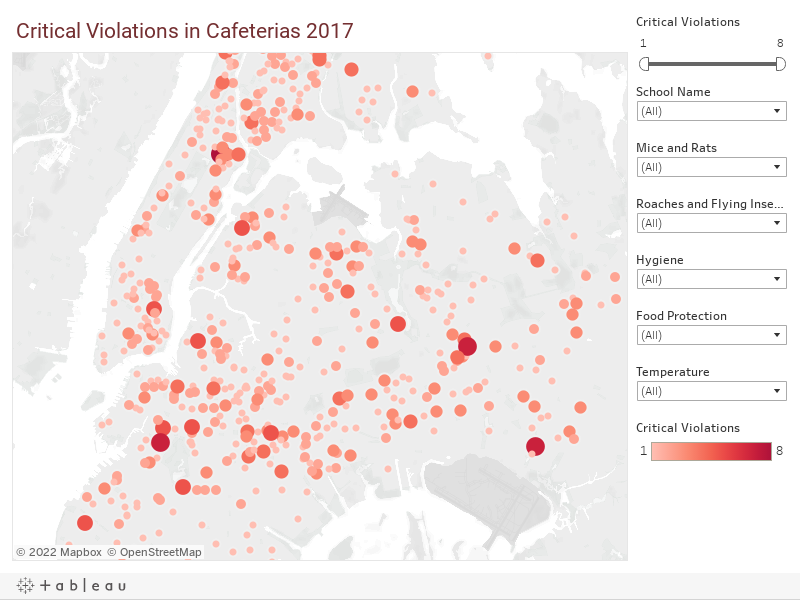 In 2017, about 1,400 city school cafeterias were inspected at least once. Some cafeterias serve several schools. The Health Department said the 15 inspectors assigned at any given time to school cafeterias are sufficient to do the job. More than one in six people nationwide get sick from a foodborne illness every year, according to the federal Centers for Disease Control. While health inspectors routinely find violations at New York City schools, what remains less clear is how often the conditions lead to outbreaks of foodborne illnesses. The science for confirming those cases takes time, and the victims might not be certain whether they got sick from eating something at school, home or elsewhere. “We have a hard time determining whether more infections are caused by certain types of critical violations, because we don’t have strong estimates of infections,” said Valerie Yeager, a public health expert and professor at Indiana University-Purdue University Indianapolis. Yeager noted that inadequate hand washing facilities, improper food-handling temperatures and live pests are among the biggest harbingers of potentially dangerous conditions. Olga Glazman, a former New York City health inspector, said that even if vermin encounter poison traps, they might not die immediately and instead could invade food, spreading dangerous chemicals. “I would be very worried if I see droppings. Mice contaminate surfaces and food, for example they can chew flour and grain packages, they spread viruses,” she said. To be sure, New York City schools did make one improvement in the past year, providing more information online about the cleanliness of kitchens. Anyone can look up a school’s cafeteria online to see violations. This was done in December to comply with the new state law. But the reports are not complete. The full reports – like those obtained from the city Department of Health by the NYCity News Service – include details not found on the school’s new web pages. Among the information missing online: the severity of violations. At least five suspected outbreaks of foodborne illnesses have been reported in New York City public schools since 2016, according to news accounts and Department of Education statements at the time. In those instances, at least 300 children complained of stomach pains or went home sick. 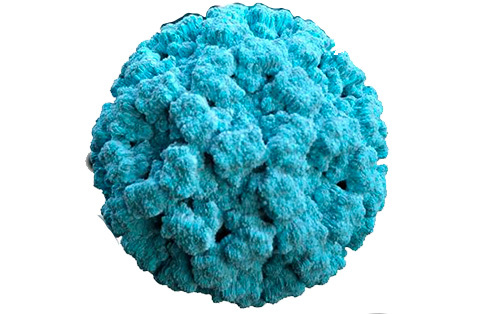 Almost all the cases were suspected to stem from norovirus. Although norovirus can spread through human contact, Health Department inspections conducted after some, but not all, outbreaks could not confirm a connection to cafeteria conditions. Jan. 14, 2016: More than 200 students fell sick from norovirus at P.S. 12 James Colgate School in Woodside, Queens. The school was shut down for the day. An inspection on Jan. 27 reported one general violation for improper construction and maintenance. Jan. 29, 2016: A dozen students caught norovirus at P.S. 58 Space Shuttle Columbia School on Staten Island. The school was disinfected and inspected by the health department on Feb. 3. The inspector found one critical and two general violations, and requested stool samples from school food workers to see whether anyone had been sick. Medical reports showed no traces of norovirus. May 1, 2016: An unreported number of students fell sick from a stomach virus at Our Lady Queen of Peace on Staten Island. Officials closed and disinfected the school for a day. There were no inspections conducted after the incident. Nov. 2, 2016: Paramedics were called to P.S. 160 William T. Sampson School in Borough Park, Brooklyn when 15 to 20 students fell sick with “norovirus-like symptoms.” All students were sent home. The school was disinfected and inspected, revealing three general violations. Dec. 16, 2016: More than 100 students and staff caught norovirus at P.S. 83 Annex Donald Hertz in the Bronx. The school was closed and disinfected, and a subsequent health inspection found three general violations. Still, in all of the schools where outbreaks were suspected, subsequent inspections uncovered health violations. These included critical violations like dirty utensils and flying insects, records show. It was not the first such action: In May 2016, officials suspended serving pizza because of discoloration issues in some slices. Independent lab tests showed the problem posed no health risks, officials said. Brooklyn’s John Jay campus, home to three schools that share the same cafeteria, has had one of the worst health inspection records in the city in the past five years. The most recent inspection, on Nov. 11, found mice in the cafeteria area and inadequate dishwashers, records show. Starting in the last school year, high school students at the Park Slope campus were allowed to go out for lunch. Some students bring lunch from home, but not everyone can afford to do so regularly. Ditto for students without enough money to dine out five days a week. Heaven Santiago, 16, a junior at the John Jay campus’ Secondary School of Journalism, said she hasn’t eaten cafeteria food since middle school. Lizeth Beltran and Nicole Rothwell contributed reporting. FOOD PLIGHT is a product of the NYCity News Service at the CUNY Graduate School of Journalism.